It has been eight months since my last oil change and the “Maintenance Required Soon” indicator has turn on. Time to change the engine oil! Toyota recommends to change the engine oil on a 3rd gen Prius (2010-2015) every 10,000 miles under normal driving condition and every 5,000 miles under harsh driving condition. Harsh driving condition means driving over 50 miles everyday, driving through dusty environment, lots of stop and go traffic or through extreme heat (90º F or higher). 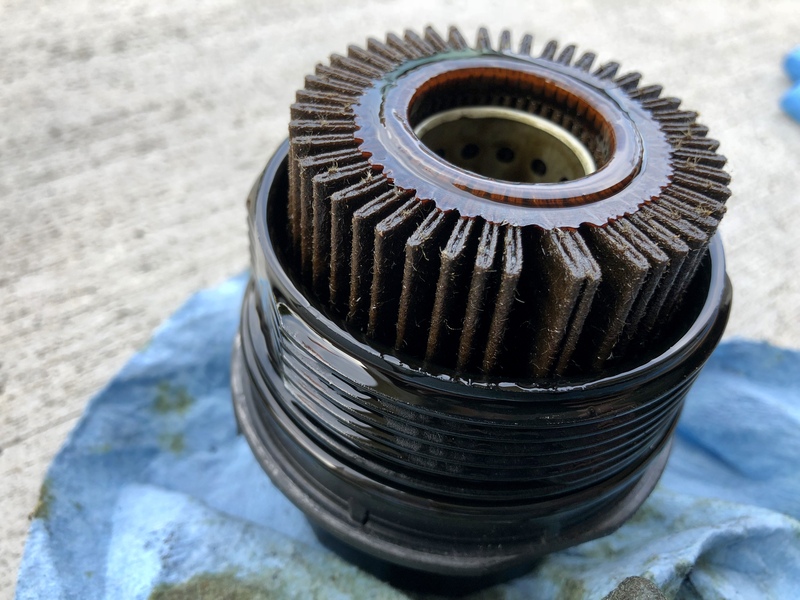 If your 3rd gen Prius is experiencing oil consumption, which usually starts to happen as early as the 100,000 mile mark, then you may need to change it out every 5,000 miles instead of 10,000 miles. If your Prius has reached the 75,000 mile mark, I would recommend to consider changing the oil every 5,000 miles as a preventative measure. 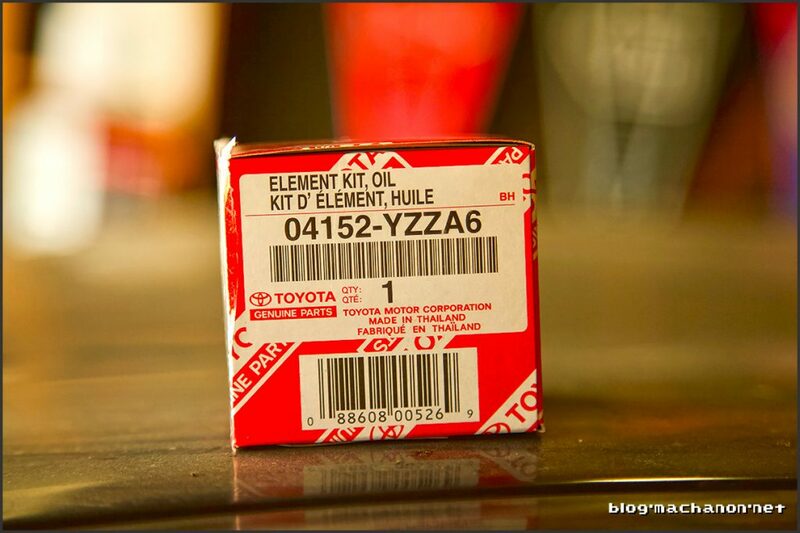 The Toyota recommended motor oil weight and viscosity is 0W-20. At higher mileage, I started using Mobile 1 High Mileage 5W-30 synthetic motor oil created for vehicles with over 75,000 miles to mitigate oil consumption and promote engine seals. 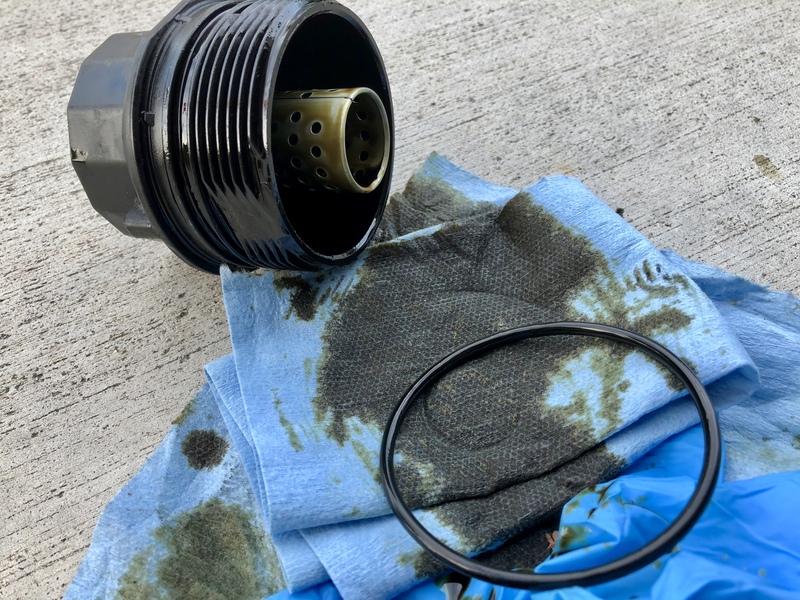 Living in Southern California where the weather is generally warm year round and scorching during the summer, the higher weight motor oil is not a concern for me and does not detrimentally affect the Prius’ engine or its overall fuel efficiency. 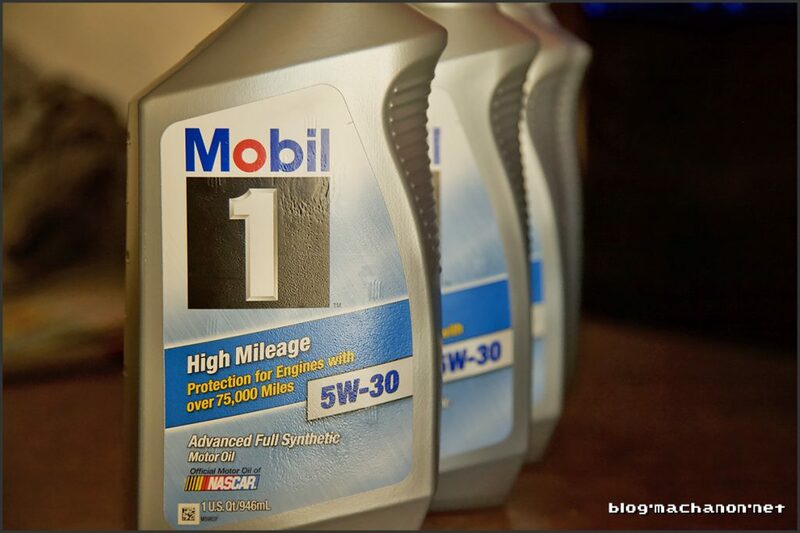 I do switch to 0W-30 motor oil grade during the cooler winter months of November-March, however. I changed the engine oil on the Prius at 124,075 miles using 5w-30 synthetic oil right before hitting up Las Vegas for the July 4th weekend in well over triple degree weather. The total round trip mileage for this road trip was 574.3 miles and the Prius yielded an average fuel efficiency of 44.45 mpg, traveling mostly on an uphill grade. On normal highway road trips, I noticed I am actually getting increased fuel efficiency using 5w-30. 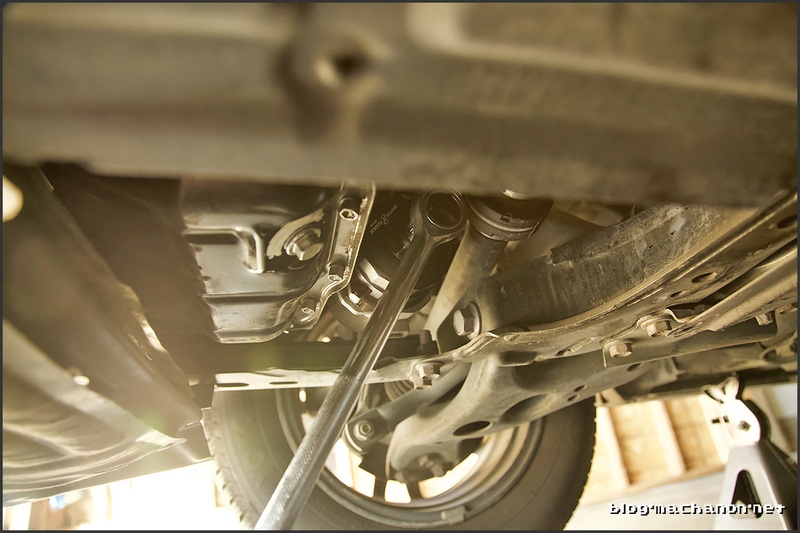 While you are change the engine oil, you may want to take the opportunity to rotate your tires as well. Start by driving your Prius around the block for about 10 minutes to adequately heat up the motor oil. This loosens up the oil and helps drain the old oil easier and quicker. Park your Prius on a flat and even surface, preferably shaded. Put on a pair of safety glasses and work gloves. Begin jacking up the front of the Prius and then placing a jack stand at each of the front jack stand support on the chassis. Remove the oil cap from the engine block and set aside. 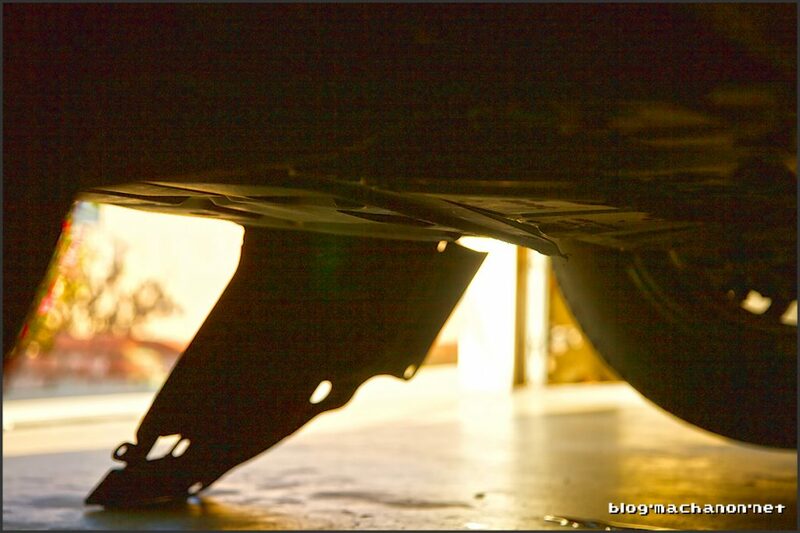 Pull the service panel down to gain full access to the oil pan and oil drain bolt. 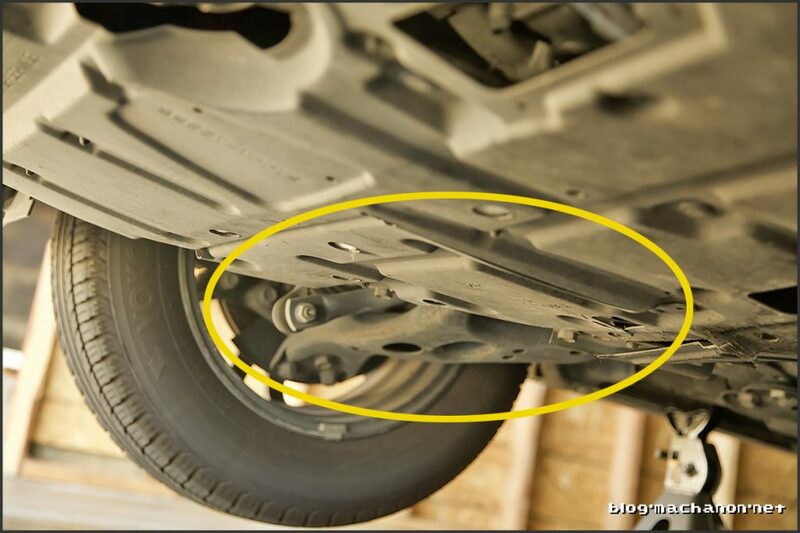 Place your oil catch pan beneath the oil drain bolt. 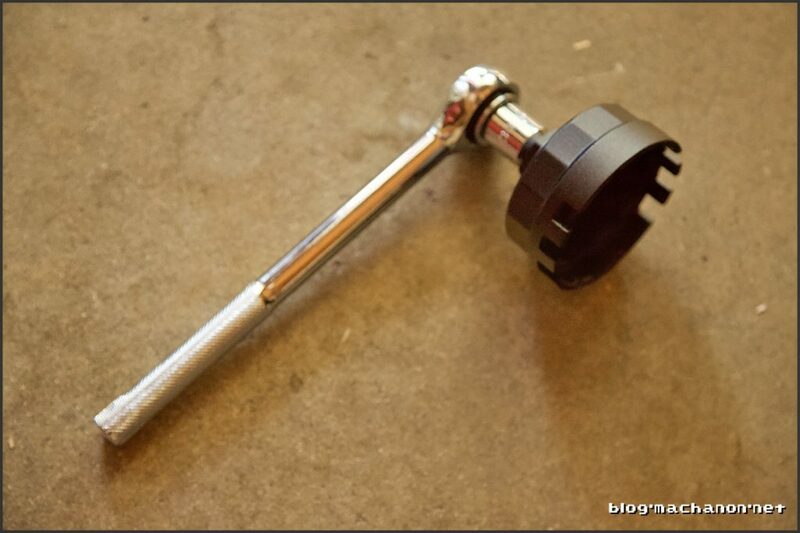 Using a 14 mm short socket, loosen the oil drain bolt and then untighten with your fingers and set aside. Allow the motor oil to drain completely, about 5 minutes. 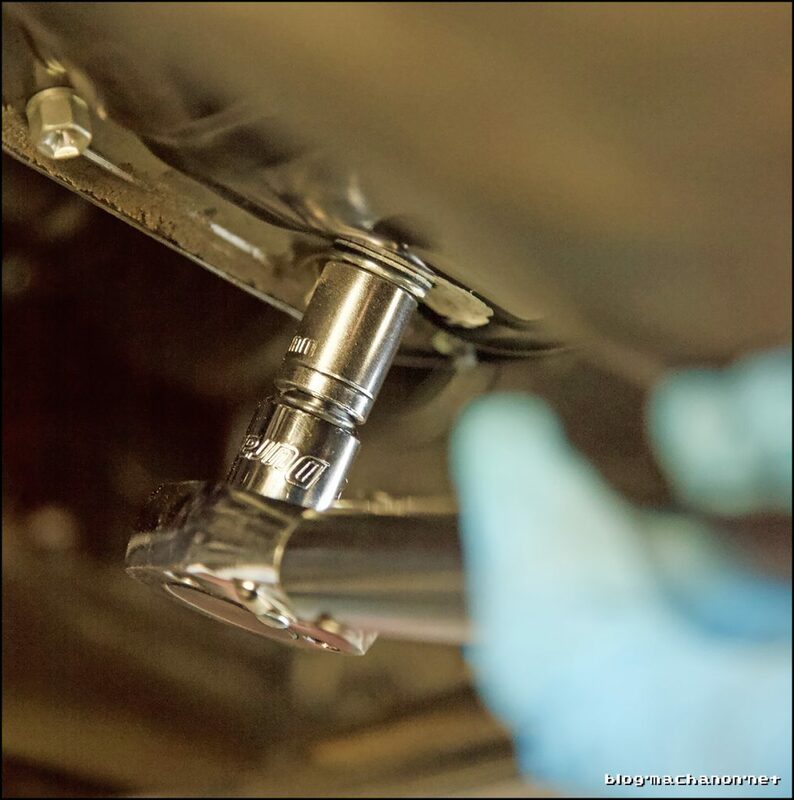 If the oil drain bolt is hard to remove, use a breaker bar to break it free. 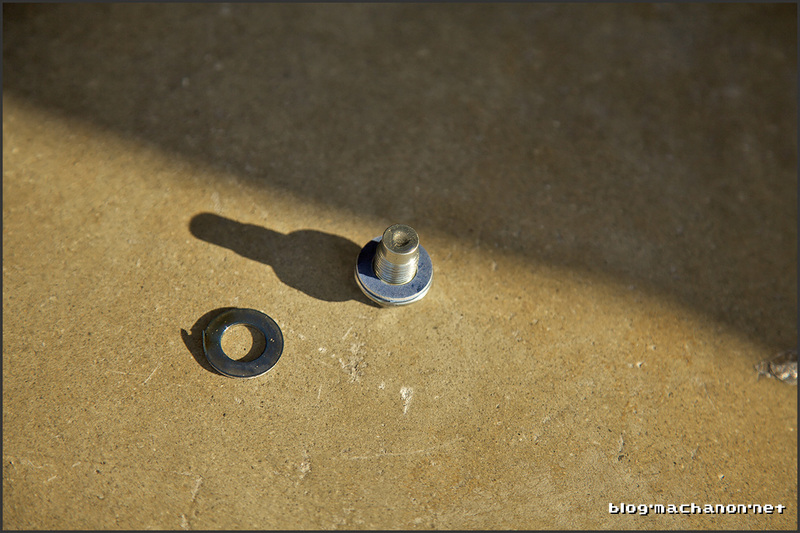 Remove the nylon crush washer from the drain bolt. This crush washer may be stuck onto the oil drain pan. If so, use a Flathead screwdriver to pop it off. Once the motor oil has completely drained, couple the oil filter wrench onto the oil filter cap, then attach a ratchet onto the oil filter wrench. Remove the oil filter cap by turning the ratchet counter clockwise. 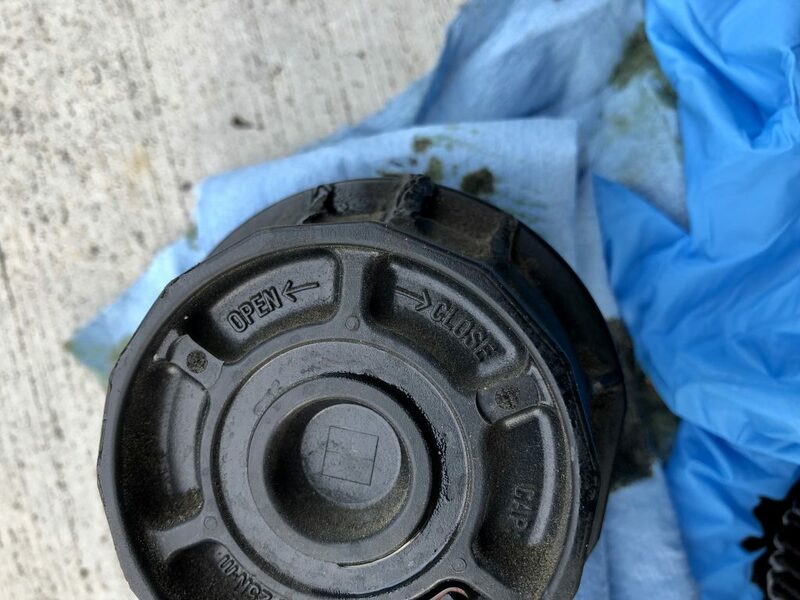 If the oil filter cap is hard to remove, which seems to be a common situation with Prius owners who took their car to the dealership, use a breaker bar to break it free. You may need to raise the Prius higher for adequate clearance to exert enough force on the breaker bar. 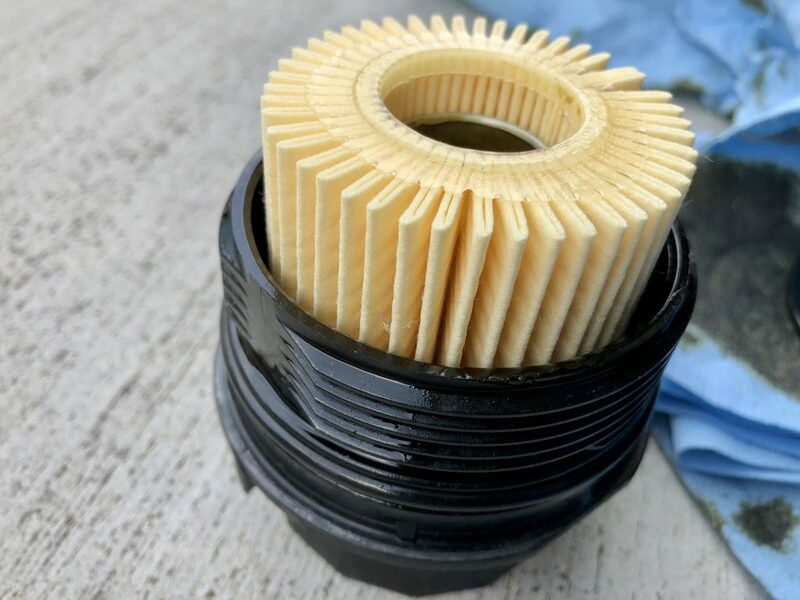 If you still unable to break the filter cap free, you may need to attach the oil filter wrench cap onto an impact wrench and use the hammering action of the impact wrench to break it free. 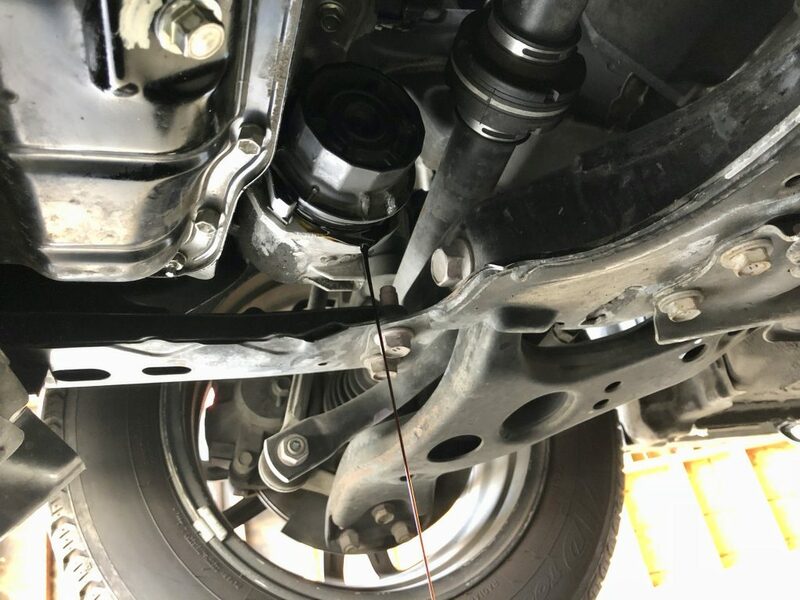 Be sure to torque it to the recommended spec of 18 ft/lb when tightening back on so you don’t run into the same problem in the next oil change. Remove the old O-ring rubber gasket and filter element from the oil filter cap and discard. Apply a small amount of motor oil to the new O-ring rubber gasket to lubricate it, then slide it onto the oil filter cap. 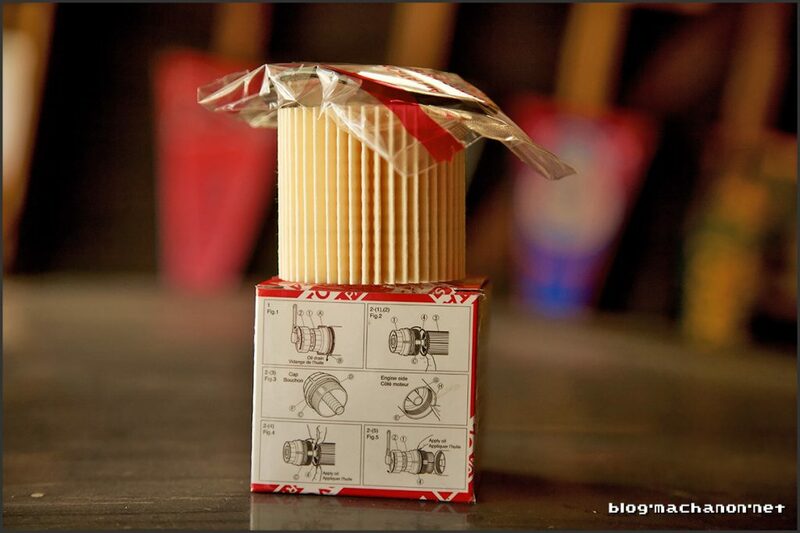 Insert a new filter element into the oil filter cap. Wipe excess oil from filter cap and oil pan with shop towels. Set your torque wrench to 18 ft/lb and tighten the oil filter cap back on. If you need to replace your oil filter cap, the part number is 15620-37010 and priced between $20~$30. Once the filter is in snugly in place, set your torque wrench 27 ft/lb and insert a brand new nylon crush washer onto the oil pan drain bolt. 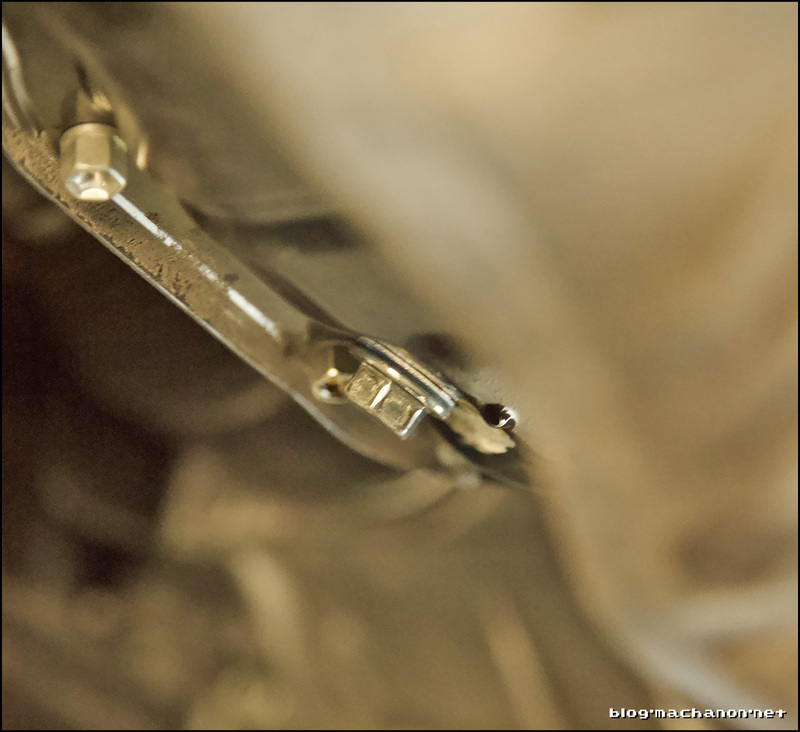 Tighten the drain bolt back onto the oil pan until your torque wrench clicks. Wipe any remaining oil from the service panel, oil pan and surrounding area. Fasten the plastic clips removed from the service panel on step 3 and then lower the Prius. 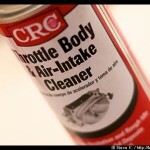 Pour four quarts of 0W-20 motor oil into the oil filler hole on the engine and wipe off excess oil with shop towels. Install the oil filler cap. Start the Prius and take it for a short drive, then park it at an even and flat surface. Turn the Prius off and wait 5 minutes for the new oil to settle down into the oil pan. 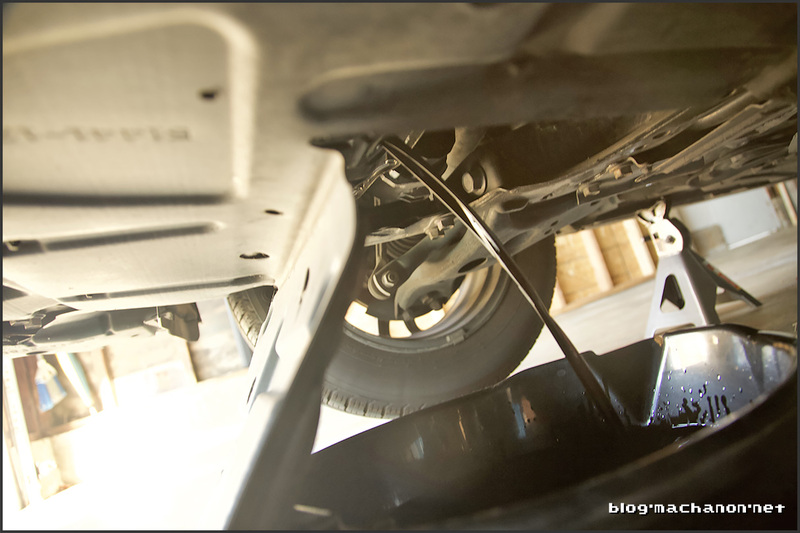 Check the dip stick to ensure that the oil level is close to or at the full level. Add additional motor oil as necessary. Pour the old oil back into the empty quart bottles with the help of a funnel, then dispose of it at the closest hazardous waste recycling center (most AutoZones accept used motor oil for recycling).